For any English-speaking people, the QFHS is THE family history society to go to for help searching for ancestors in the Montreal area and in fact all of the province of Quebec. Other major societies are the Jewish Genealogical Society of Montreal and the Société de généalogie de Québec. You are also welcome if you are French-speaking and want access to our resources. Begun in 1977, the Quebec Family History Society has grown over the years from a small office in Pointe-Claire, Quebec, to a large office and library in the same building. 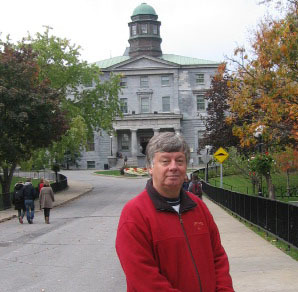 Gary Schroder, long-time President of the Quebec Family History Society, outside of McGill University before leading a tour of McGill and Concordia libraries in October 2013. Gary shares his vast knowledge in an entertaining and engaging manner. Every year, the Society's president, Gary Schroder and others provide seminars on how to research your family roots, how to use and where to find resources and how to think genealogically, often focusing on Irish or Scottish roots. Tours of Montreal-based archives and libraries are also offered. Through the fall and spring seasons, speakers are invited to present public lectures at a locale near the library. Local members may borrow items from among the collection which includes local histories of Quebec, military histories, family histories, cemetery record transcriptions, publications of many family history societies in the English-speaking world. The Catalogue can be searched here. The society's journal "Connections" is published three times a year and depends on contributions from members and others interested in genealogy and Quebec. Free onsite access to Ancestry.ca and the complete version of the Drouin collection is available on several computers. For a fee, an expert will search for your family connections for you. FamilySearch is in the process of digitizing its microfilmed/microfiche collections. Many of these, which are blocked at your home, are accessible at the QFHS Heritage Centre and Library. Bring your sign-in information with you. The Church of Jesus Christ of Latter Day Saints have filmed records from around the world which can be discovered through their catalogue. These are a few of the services offered by the Quebec Family History Society which can be of use when researching English-speaking or British immigrants in Montreal and Quebec. The resources are also useful if you have French or other language background ancestors. For more than 20 years, Gary Schroder has been at the helm of the QFHS aided by many volunteers, various Board Members and Joan Benoit, the Executive Secretary. During those years, Gary Schroder has been able to dedicate full-time hours without remuneration for his love of family history and his desire to further research, materials and knowledge of the history of the Province of Quebec, notably in relation to the English-speaking residents who contributed to the growth and success of this province.